As I continue my digital drawing adventure I fall more and more in love with drawing in Photoshop. 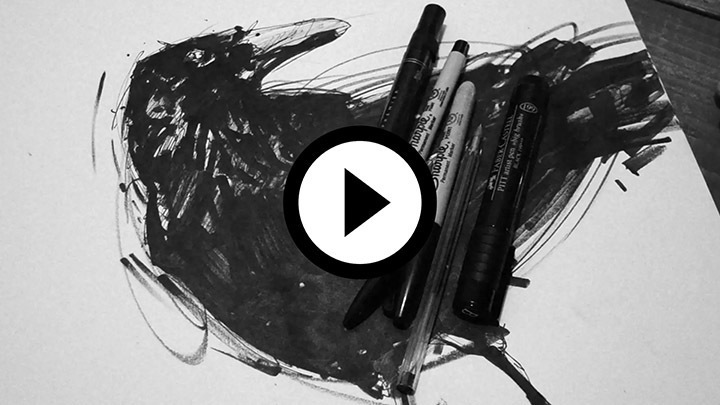 This crow illustration had to have a certain textural element to it. So I spent a little time on the green background to make it random in texture. Then I added a rough outline of a crow in the bottom left to give a sense of depth to the overall image. As a restriction for myself, I give myself the rule that I can’t erase or “undo” anything as I’m drawing digitally. The imperfections you get when you draw on real media is what makes drawings interesting to look at. It’s what makes drawings unique to the artist. All the imperfections are a record of what the artist was thinking as they captured whatever image was in their head.